Mixed: King Ginseng Oolong and Dian Hong Black Pagoda. 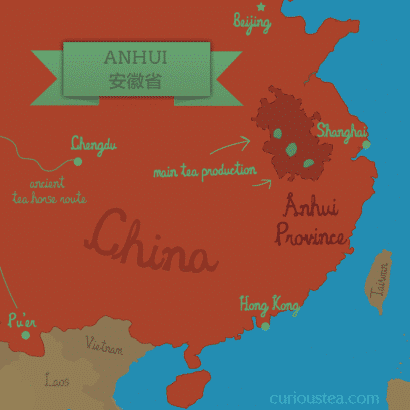 Welcome to another month of Curious Tea subscriptions! This month we have very interesting teas for your tasting over the holiday period: a rather fine Taiwanese oolong that is blended with a touch of ginseng, an exquisite and very light Chinese green tea, a wonderful pagoda shaped and delectable Chinese black and finally a superb dark oolong from Darjeeling. Mi Xian Oolong and Gui Fei Oolong. We had a great time finding these fantastic teas to share with you. And we are particularly excited that we were able to incorporate the little extra tasting pack for you all. We hope you will enjoy our selection, and to help you along with the tasting, here is some further information on everything featured in our December boxes. Now we are not huge fans of flavoured teas here at Curious Tea. This is for many reasons, mainly because we believe that the vast majority of teas have fantastic flavours of their own that do not need any additives to alter them. Another reason is that normally a very boring (and normally quite cheap and low quality) base tea is used to make many of the flavoured teas out there. But occasionally we do find an odd tea that has been scented or blended in a traditional way to produce something particularly special. So far we have only ever had one fragranced tea before: Jasmine Pearl in December 2014. It proved to have been quite a popular one so when we found this fragrant Ginseng Oolong, we thought it was time again to put a traditionally scented tea into one of our boxes. The reason we selected this particular Ginseng Oolong would be apparent to anyone who has ever tried other pellet style ginseng oolongs before. Normally they consist of lower grade leaves that have been covered in a case of green ginseng powder. These normally come from China and they produce quite a strong tea that has an extremely sour taste, which can often be quite unpleasant and overwhelming. When you try our Ginseng Oolong, you will not find any of those unattractive characteristics. Instead you will get a wonderfully fragrant cup that has a lovely floral taste. This is the result of the tea master carefully blending together the high quality oolong leaves with only a small amount of high grade ginseng, just enough for the tea to acquire its special character. We selected this King Ginseng Oolong for the December Light and Mixed boxes. 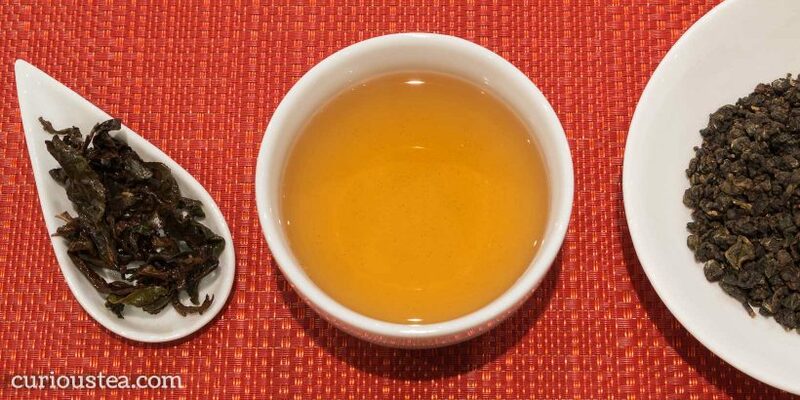 The leaves of this oolong are very tightly rolled and are dark green in colour. The dry leaves have quite a strong but pleasant fragrance of violets. When brewed the dry leaves unfurl so you can see whole leaves (often the tips plus two top leaves) in your tea pot. The liquor produced is light in colour and still has that lovely fragrance of violets of the dry leaves. The taste is very smooth, very floral, tasting of creamy sweet violets with a slightly tart edge on the finish. A very nice tea to keep you going at work after your lunch break! You can buy King Ginseng Oolong from our online shop. Tai Ping Hou Kui is a wonderful light green tea that comes from Tai Ping County of Anhui Province, China. This is one of the Chinese teas that has a great name when translated. While Tai Ping is a place name, it can also be translated as ‘peaceful’. Hou Kui means ‘monkey chief’ or ‘monkey leader’. So the literal translation of Tai Ping Hou Kui is ‘Peaceful Monkey Leader’. As this translation is not particularly common, we opted for using the Chinese name for this tea instead. The production of this particular style of tea really only took off in the early 20th century but it has since gained significant popularity both in China and in the West. So much so that it is now sometimes listed as one of China’s famous teas. Tai Ping Hou Kui is extremely well processed, most of the processing taking place by hand. The hand plucking is done very carefully to ensure that the bud and the top leaves are plucked together. They are then checked again at the factory where they ensure the leaves meet the rigorous standards. This tea is different as, unlike most green teas, it does not undergo any process of rolling. The leaves are simply dried in bamboo baskets that are heated to different temperatures. This results in the leaves retaining much of their original shape once dried. We chose this Tai Ping Hou Kui for our December Light subscriptions. The fine green leaves of this tea are very long and are straight, retaining the original shape of the leaves prior to the drying process. The dry leaves have a wonderful green peach aroma to them. The liquor produced is very light in colour with a pleasant fragrance. The taste is also light, very smooth and slightly sweet and vegetal. There are notes of creamy vanilla and sweet peaches to round off the taste. A wonderful cup that is smooth and refreshing, perfect on a cold winter’s morning! This tea is best brewed at 80°C for 2-3 minutes and can be brewed multiple times. When experimenting with repeated steepings, you can gradually increase the water temperature and steep time to extract fuller flavour. You can buy Tai Ping Hou Kui from our online shop. Dian Hong Black Pagoda is a speciality tea from Yunnan Province of China. Dian Hong, literally Yunnan Red, refers to the origin and type of tea (red according to Chinese classification) and Black Pagoda refers to the type of tea (black according to western classification) and the fact that it comes in pagoda or tower shapes. 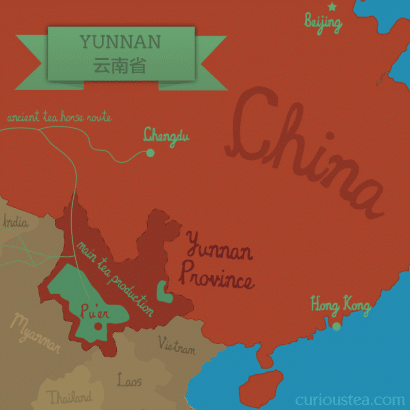 Yunnan is famed for its production of pu-erh, a fermented type of tea. There is also a rather large production of black teas in this province, which are gaining particular popularity due to their smooth and sweet characters with almost no astringency and only a touch of maltiness. Dian Hong types of tea are favoured due to their gentle aroma and flavour, which lacks any astringency. This Dian Hong has been tied together into pagoda shapes prior to drying. After the leaves are dried, they retain this tower shape but once they are submerged in water, they open up to form a flower shape. Most flowering teas tend to come as green or white types of tea. As with flavoured teas, flowering teas tend to use cheaper base ingredients as most of the cost goes into the laborious processing of these hand tied teas. The Dian Hong that we selected is also simply hand tied, but unlike many flowering teas, the actual tea used to produce this one is of a very high quality, yielding a cup of tea bursting with fantastic flavour. 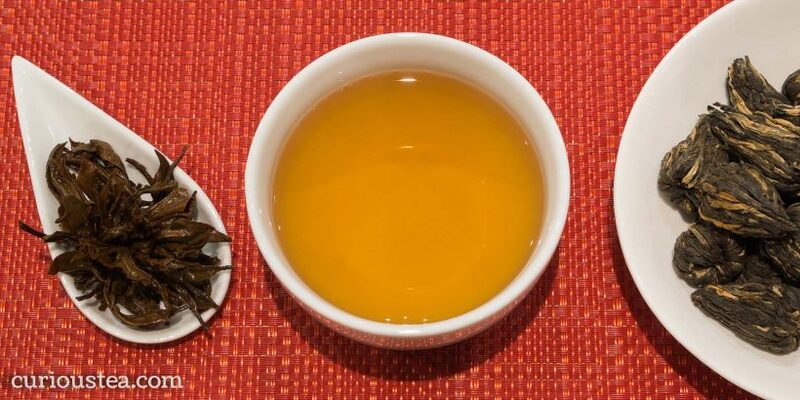 This Dian Hong was selected by us for our December Dark and Mixed subscription boxes following the runaway success that we had with our Yunnan Golden Tip tea. 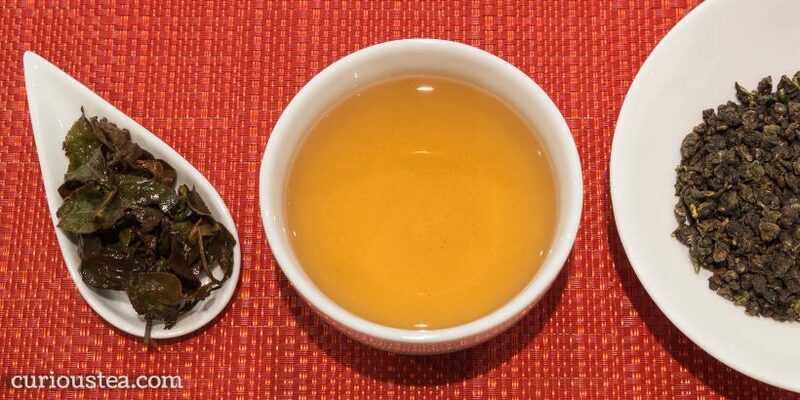 Just like the previous tea, this one has plenty of golden tips which are evident on the dry pagodas. When you brew these pagodas they open up into flowers and produce an amber liquor with a lovely aroma. The taste is mild and sweet and well balanced. There are lots of sweet notes of honey and caramel with a hint of spiced orange. A smooth, comforting but also refreshing cup of tea, perfect for an after dinner drink. This tea is best brewed with water at 1oo°C for 4-5 minutes. It can also be brewed more than once; we found two brews being the optimum amount. It is best taken without milk or sugar. You can buy Dian Hong Black Pagoda from our online shop. This is a lovely, fully organic oolong from the Makaibari Estate in Darjeeling. Makaibari Estate is well renowned for its bio-diverse approach to tea growing. Most of the estate is still covered in forest, which promotes wildlife and good soil management. In combination with organic practices, it enables the Makaibari Estate to produce tea that is not only certified fully organic but is of a particular character that is unique to the terrior that they carefully manage within their estate. This approach of caring for their surroundings also extends to social responsibility policies of the estate, which works together with the local communities to create long-term projects for the common good in education, local empowerment and sustainability. It is always great to find a tea that not only tastes good but one which supports great projects around the tea growing areas! This particular oolong really does walk a fine line between green and black tea. Somewhere right in the middle, it manages to take best of both worlds and produce a tea that has a character that is both unique and very much Darjeeling-esque at the same time. This tea is a second flush picking, which means it is plucked in summer when the leaves have a stronger character than the first flush plucking, perfect for making these well balanced floral oolongs. We were quite excited when we first tried this oolong as we thought it would make an exquisite tea to feature in our winter boxes, so it was picked for our December Dark selection box. The dried leaves of this second flush oolong are rather large and have a very beautiful appearance with plenty of green and gold colours. The liquor has a light amber colour and a lovely floral fragrance. This tea has a wonderful light profile that is somewhere between a strong sweet green tea and a very light smooth black tea. The taste is sweet and floral with a slight vegetal and fruity apricot note! A wonderful afternoon tea that can be enjoyed on its own or would go perfectly with light pastries and cakes. This tea is best brewed at 90°C for around 3 minutes and can be brewed multiple times. Best taken without milk or sugar. You can buy Darjeeling Makaibari Oolong from our online shop. We are offering to all our subscribers a small but very special Christmas treat in the form of a little taster of the same tea in two different forms. The Mi Xian Oolong is pretty much a ‘raw material’ tea that is used to make a rather special tea, the Gui Fei Oolong. The difference between them is that the Mi Xian Oolong has not undergone any finishing (baking in this case), while the Gui Fei Oolong is the fully finished article that has been baked by the tea master to her specifications (yes, the tea master that makes this particular Gui Fei Oolong is a woman). Both of these oolongs are essentially the same tea during different stages of processing. 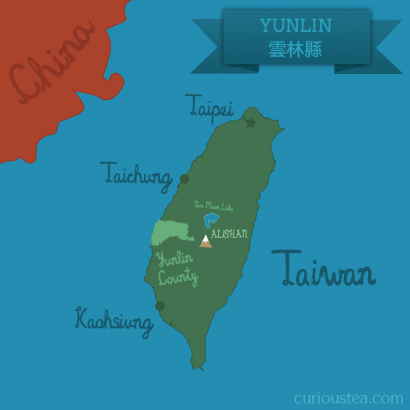 They come from Yunlin County of Taiwan, are classed as ‘beauty teas‘ and thus share a unique growing story. Beauty teas are extremely unique for their honey-like flavour that occurs due to presence of little green leaf hoppers that nibble the tea leaves during growth. The tea plants react to this attack by producing more polyphenols, which during processing give the tea the unique ‘beauty tea’ flavour. Most beauty teas, such as the well-known Oriental Beauty are more heavily oxidised oolongs, which some people even class as black teas. This offering is quite unique as both of these oolongs have undergone a medium level of oxidation (around 40%) so they are much lighter than the standard Oriental Beauty style tea. This is a unique opportunity to discover and compare two versions of the same tea and see for yourself the difference the finishing processing make to the flavour of the tea. Particularly, it is almost impossible to get hold of any unfinished Gui Fei Oolong, so we worked together with the farmer and the tea master to secure a very limited amount for us in order to create this taster set. 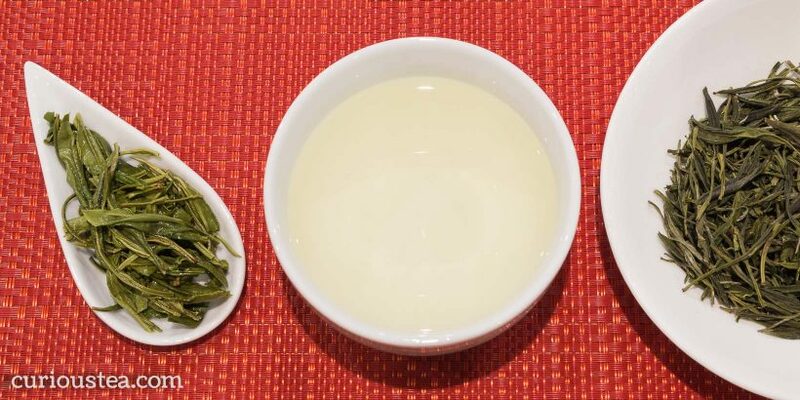 Mi Xian Oolong is a ‘beauty tea’ that is ‘raw’ so it has not been baked; in essence, it is the tea that serves as the base tea to make the Gui Fei Oolong. This particular one was a supremely good crop that has developed a particularly pronounced ‘beauty’ flavour. The leaves are tightly rolled and are greenish-brown in appearance. Once brewed they unfurl and produce an amber liquor with a wonderful aroma. When tasting this tea, it has a milder wild honey flavour, with lighter sweet and floral notes. It is particularly interesting to taste this Mi Xian Oolong prior to tasting the finished Gui Fei Oolong to fully appreciate the work the tea master undertakes in producing a finished product. As with all teas, terroir and growing conditions are not the only contributing factors to the final taste. Equally important are the skills of the tea master that finishes the tea. Tasting this Gui Fei Oolong alongside our Mi Xian Oolong, you can really appreciate the difference the finishing processing makes to the tea that you buy and drink. This Gui Fei Oolong started life as the Mi Xian Oolong and then it underwent a three stage baking process by the tea master with several week-long mellowing breaks in between. This processing allows the flavours and aromas to stabilise and fully saturate the leaves. While altering and improving the flavour of the tea, it also acts as a stabiliser for the flavour allowing the tea to remain consistent over longer periods of time. Contrasting that, an unfinished tea is very ephemeral. 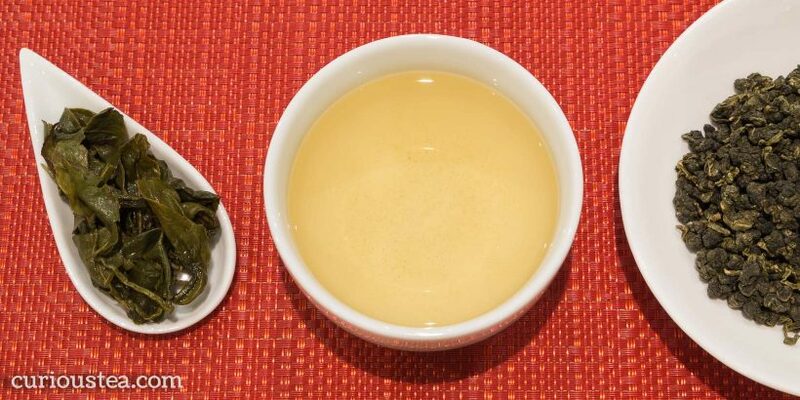 This Gui Fei Oolong has been baked, so you can notice that the leaves have become darker in colour and the colour of the liquor produced is also a little darker. This type of processing brings out a more distinctive wild honey flavour, with sweet, floral and woody notes in this tea. This tea is best brewed at 90°C for around 4-5 minutes and can be brewed multiple times. 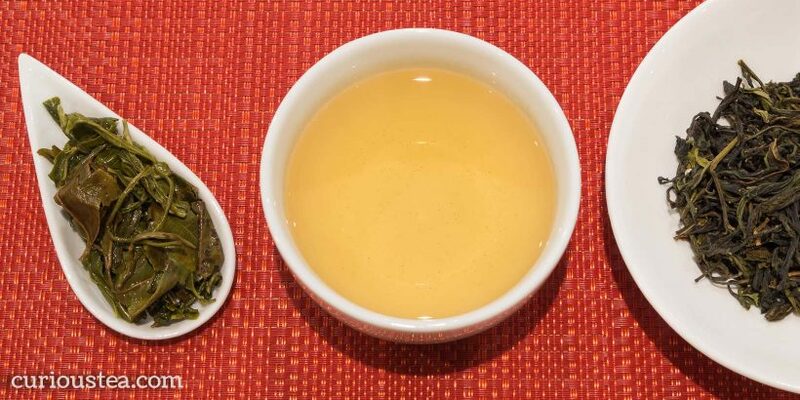 We think that both of these oolongs are absolutely fantastic teas that have a wonderful and unusual flavour. As it is almost impossible to get unfinished teas, this is a very rare and unique opportunity for all of our subscribers to try both and see for themselves the kind of difference the finishing processing makes. We really hope that you enjoyed the tea club selection for December as well as the little tasting gift and are looking forward to what we have in store for your selections in the New Year! Happy tea tasting and happy holidays! 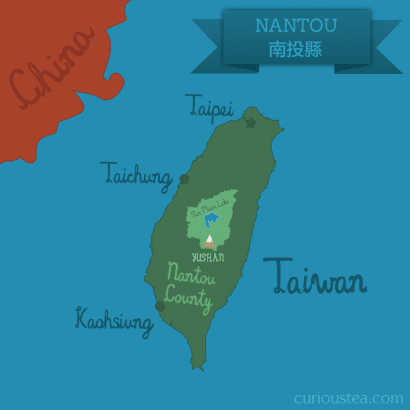 This entry was posted in Monthly boxes and tagged black tea, China, Darjeeling, green tea, Nantou, oolong, Taiwan, tea on December 15, 2015 by Curious Tea.